1. Preheat the oven to 180°C, gas mark 4 and lightly grease a 6-hole ring doughnut pan spray oil. 2. Mix the mashed banana with the beaten egg, honey, cinnamon, salt and melted butter. Fold in the flour and baking powder until just combined. 3. Spoon the batter into the doughnut pan. Bake for 10-12 minutes when the batter is risen and turning slightly golden at the edges. Turn the doughnuts out onto a wire rack and leave to cool. Rinse and grease the pan and repeat the filling & baking process with the remaining batter. 4. To make the glaze, melt the butter in a small saucepan over a medium heat. Remove from the heat and then stir in the almond butter and honey until smooth. 5. 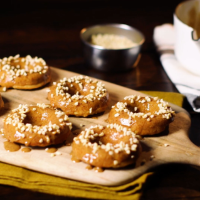 Dip the face of each doughnut into the glaze, place onto a wire rack, sprinkle with the chopped almonds and leave to set. This recipe was first published in Thu Oct 29 14:56:48 GMT 2015.